Yesterday’s forecast predicted that thunderstorms would come through and create a break in the hot weather. Planning ahead, I decided I’d do a nice, cool, morning run today instead of Casey’s, but since Ruth was still planning to head over to the bar to run in the evening, I volunteered to time the race and give her a ride home afterward. There were plenty of storms south of Boston throughout the afternoon yesterday, but nothing much in Arlington. Even so, in the face of the ongoing threat, Ruth and her friends decided to call off their evening run. That turned out to be the right choice. Just after Ruth got home from work, a heavy downpour hit us. Soon the storm drains were clogged with leaves. Water was backing up the street and spilling down our driveway so I went into the garage to grab a rake so I could clear the drains. When I opened the garage door to go outside water started pouring in. Time for a quick change of plans. I closed the door, which stopped the flooding before the the water inundated the garage (and our basement storage area). Then I took the rake upstairs and out the front door and waded into the pool at the bottom of the driveway to clear the drain there. I watched happily while the rainwater swirled into the catch basin and then I went up to the street to clear the drains there so the rest of the water would run into the sewers instead of down our driveway. Once the rain slowed down, I opened up the garage door and swept the water inside back out onto the driveway. All seemed well. But the worst was still to come. Just about the time when Ruth and her friends would’ve been starting their run, the storm picked up again. This time it got a little scary. There was more heavy rain, this time with winds was strong enough to pry our closed storm doors away from their frames. Apparently, East Arlington was hit by a microburst, a type of strong downdraft that can cause tornado-like damage over a small area. The intense weather only lasted a few minutes, but that was more than enough. I was glad Ruth had stayed in. She’s practical that way. If I had a run planned, I probably wouldn’t have been as smart. We were lucky. We had some debris in the yard, but no damage. There were a few branches down in the street, but nothing that we couldn’t move off to the side. Many people in East Arlington didn’t fare as well. The news was filled with stories of flooding, downed trees, and power outages. We got a message from the town’s emergency e-mail list asking everyone to stay off the streets so emergency crews could get to work. 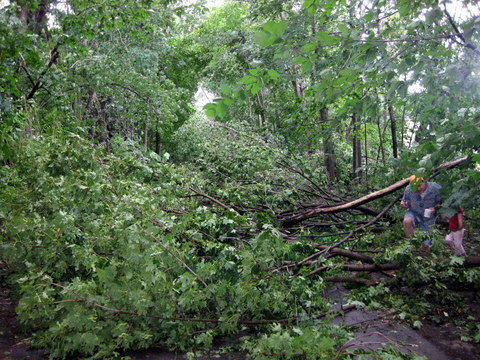 Ruth saw a report that said hundreds of trees were damaged. I was sure that had to be an exaggeration, but I was wrong. In the morning, I went out for a run to explore the area. Almost immediately, I saw that many of our neighbors weren’t as fortunate as we were. There were broken and uprooted trees everywhere. The very first side street I came to was blocked off to keep people away from the wires that had been knocked down by the tree resting on the porch of the house on the corner. When I got to Arlington Center, I turned down the Minuteman Bike Path toward Alewife Station. I waved to the TV chopper hovering overhead, surveying the damage, and then I spent the next mile picking my way through all the trees that were lying across the path. There were at least 20 of them down, probably more. After crawling under yet another tree, I stood up to find Jonathan Davey running toward me from the other end of the path. We told each other that what we’d seen might have been bad but that there were much worse blockages just ahead of us. We may both have been right. Once I left the Minuteman, the rest of the trip wasn’t as bad. I got home, picked up my camera, and went back out on my bike to take a few pictures. Thankfully there weren’t any injuries, but there’s a tremendous amount of damage. The loss of all those trees will change the character of East Arlington for years to come. Yet once I get more than half-mile from where the microburst hit, it’s like nothing happened at all. It was cooler for my run this morning. But in retrospect, I think we were better off with the heat. 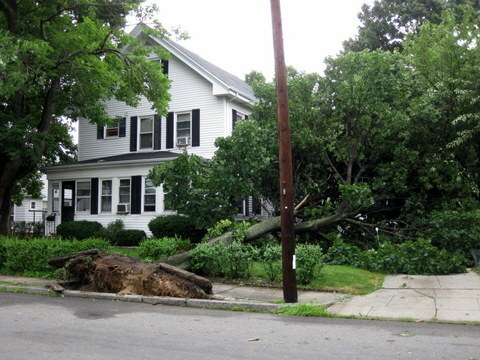 We definitely felt the storms here in Southie, but it looks like you got it worse.